After slashing the cost of home phone service, the company aims to do the same for home security. Ooma, best known as an IP telephony provider, is expanding the sensors and adding a camera to its install-yourself home security system. Ooma, one of the biggest names in VoIP (voice over internet protocol) phone service, is expanding into the DIY home security market. Ooma Telo owners will soon be able to install motion, door/window, and/or flood sensors in their homes, and add a new tier of service that provides home security monitoring. Ooma’s telephone service is basically free for calls made within the U.S. (after you buy the hardware; the Telo base station costs $100). But you’ll be billed for taxes and a government-imposed 911 access fee on a monthly basis. You’ll also need a handset to make and receive calls, but any corded or cordless handset will do. From left to right, Ooma's flood, motion, and door/window sensors. Ooma’s wireless sensors are reasonably priced and its service is an even better value. In fact, Ooma Premier subscribers who pay $10 per month for an expanded basket of services will get home monitoring at no additional cost; the service will cost $6 per month on its own. Door/window sensors will be priced at $25 each, motion sensors at $35, and water leak detectors will go for $30 each. The sensors communicate with the Telo base station using a wireless protocol called ULE, an evolution of the DECT standard developed for cordless phones. One base station can support as many as 100 sensors. As with any other home security service, you can arm the system as “stay,” for those times when you’re in the home and don’t expect the doors or windows to open (when you get to sleep, for example). In this mode, triggers from motion sensors are ignored so you can walk around the house. When armed in “away” mode, all the sensors are activated. If a sensor is triggered when the system is armed, Ooma will send you a push notification, an SMS message, and/or an email alert that there’s been unexpected activity in your home. The service will also call you. When you receive such an alert, you can open the Ooma app on your smartphone and push a button to be connected to the 911 dispatcher in the area where your home is located. As far as the dispatcher can tell, you’re calling from the house, so they’ll see your home’s street address and will have all the information they need to send a first responder. Ooma’s new home monitoring service does has a few holes: There is no connection to smoke or carbon-monoxide detectors, for instance, so you won’t get an alert if a fire breaks out or your gas-powered furnace malfunctions. And the water leak detector can’t currently link to a smart shut-off valve to shut down your water supply should a pipe burst. Finally, there is no support for security cameras that would enable you to take a look at what’s happening inside the house that might have triggered the alarm. It’s easy enough to switch to another app on your smartphone to do all of those things, of course, but it would convenient—and cheaper—to have everything rolled into one service. Those issues aside, paying $6 per month (or zero additional dollars if you’re an Ooma Premier subscriber) for security monitoring and a local 911 connection is a tremendous value. 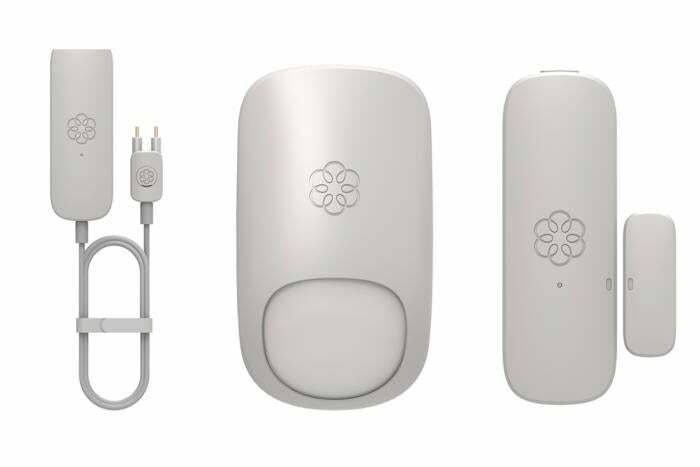 Ooma has already sent us an Ooma Telo base station, so we’ll have a hands-on review of its new monitoring service as soon as they can ship us some of the new sensors.